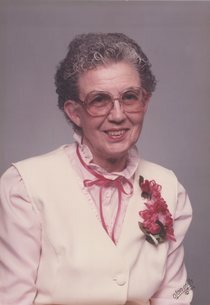 Funeral services Iva Dawn (Lockett) Dewees Keller, 96, will be held at 2:00 P.M. Monday, April 8, 2019 at the Gorman Funeral Homes-Convers Chapel in Douglas, Wyoming with Les Potter of the Glenrock Baptist Church in Glenrock, Wyoming officiating. Interment will be in the Douglas Park Cemetery. Iva Keller passed away at Life Care Center of Casper in Casper, Wyoming on Tuesday, April 2, 2019. Iva was born in Casper, Wyoming on Saturday, July 15, 1922 the daughter of Benjamin Franklin and Etta (Fletcher) Lockett. She was raised in Glenrock at the family home on Deer Creek. She went to the country school and Glenrock High School, but did not graduate. Later in life one of her greatest accomplishments was completing her G.E.D. Iva loved to work and worked all of her life. Her and her first husband, Charles Edward “Charlie” Dewees, lived and worked on the VR Ranch south of Glenrock. When they moved to town she worked at Barbers, later Kay’s clothing store. When the store closed, she cooked for Jake Kettle once again at the VR. Later they moved to Evansville, Wyoming and Iva went to work for Woolco. After Charlie passed away, she transferred to Idaho to continue with the company. In Idaho she met and married Harold T. Keller and helped him in his roofing business. After Harold was killed in an accident she moved back to Glenrock and resided in the Barber Apartments to be near her sister, Elois. She worked at the senior center thrift shop until a broken hip moved her into Life Care Center, where she spent the last two years. Iva was very strong in her faith which helped her throughout the hard times in life. Iva is survived by her sister, Elois Miller; grandchildren, Jason (Mary) Dewees, Kurt (Kristin) Dewees, and Ashley (Clint) Milner; two great grandchildren, Eric Dewees and Shawn Dewees; and numerous cousins, nieces, and nephews. She was preceded in death by her father, Benjamin Lockett, on March 13, 1962; mother, Etta Lockett, on October 17, 1975; two husbands, Charlie Dewees on April 19, 1981 and Harold Keller, on October 3, 1989; her two children, Kurt Dewees on April 11, 2001 and Ina Rae Dewees on November 19,1966; and sisters, Mary Louise Crawford on June 23, 1988 and Barbara Frances Riley on November 29,1992. Family and friends may call at the funeral home on Monday from 11:00 A.M. to 1:00 P.M. Serving as pallbearers will be Ryan Miller and members of her church family. A memorial to the Glenrock Senior Citizens Center, P.O. Box 783, Glenrock, Wyoming 82637 would be appreciated by the family.